I have no idea where I got this picture. All I know is that it's a very cool quilt. The pattern is a more complex version of Wedding Ring, sometimes called Indian Wedding Ring or Pickle Dish. 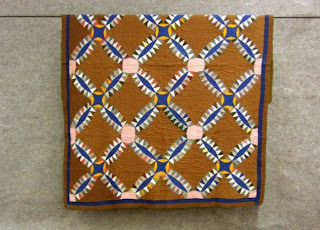 But in any case, the quiltmaker did one dramatic thing that catches our attention: she didn't place her pieced blocks against white. Instead, she chose tobacco brown as the background and that gives the whole piece more warmth and interest than plain vanilla white. 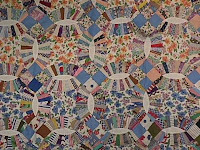 Although I've shown it before, here's the very scrappy Wedding Ring quilt top that I own. The background, if you can even discern it, is floral feedsacks. You go, girl!